More than 300 delegates flocked to this year’s packed Quest NBS conference, where Sport England’s Property Director, Charles Johnston gave an update on the Towards An Active Nation strategy. Johnston reminded operators that it’s not about how many participate in physical activity, but the impact that has, and said the 25% of the population still inactive represent a real opportunity to impact agendas far wider than sport and fitness. Mark England OBE, Chef de Mission Team GB for the Rio 2016 Olympic Games, congratulated the audience on being the wheels behind Team GBs successes, saying ‘I started out in your world’ and that delegates should never underestimate the difference they are making. He said the power of Olympic sport and Team GB to inspire and unite the nation should not be overlooked, particularly in the light of Brexit. Quest Director, Caroline Constantine gave an annual update on Quest, which has seen 115 new facilities and teams join in the last year. She congratulated the industry on its continuing improvement in many Quest modules and explained how standards overall are also improving, with many sites moving from Good to Very Good. However, Constantine encouraged delegates to keep challenging themselves, using Quest as a continuing improvement tool, by picking different modules for each assessment. Andy Reed OBE’s session was based on the book The Black Box Approach by Matthew Syed, which discusses how to approach failure and turn it into an experiment from which to learn. Reed claimed if our sector’s aim is to get the nation active then we are failing, but that, because we are afraid to admit failure, we are less likely to learn from mistakes. He said we need to change the mindset of people making decisions so we can challenge ourselves when things go wrong, seeing these as opportunities to grow. But, he said, this must be a culture change – failure isn’t fatal, but failure to change might be. 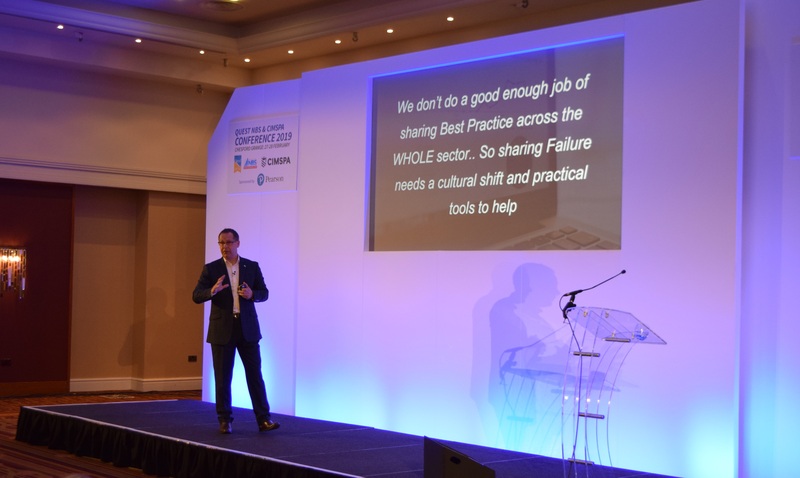 He also pointed out the importance of appetite for risk, saying if we are going to target harder to reach communities we are going to fail at times, and recommended delegates dive into areas of Quest where they aren’t performing so well and embrace it. Chris Perks, Sport England’s Executive Director Local Delivery, talked about his 12 years as a PE teacher 20 years ago. Having recently bumped into two ex colleagues he was shocked to see the stark differences in the facilities they were representing, all within the same town; one a vibrant sports club actively encouraging people to move more, and the other in a far poorer location where the facilities weren’t great. Changing the system is about leadership, he said, and that seeing people from all parts of the system working together and showing strong leadership is what will be enabling and facilitating. He encouraged delegates to get their local communities in a room with those delivering services and set a 100-day challenge to make positive changes.